Randy wrote in yesterday asking for Ugly Sweater ideas. Not for women, but for men. #1 Wear A Ladies Sweater! 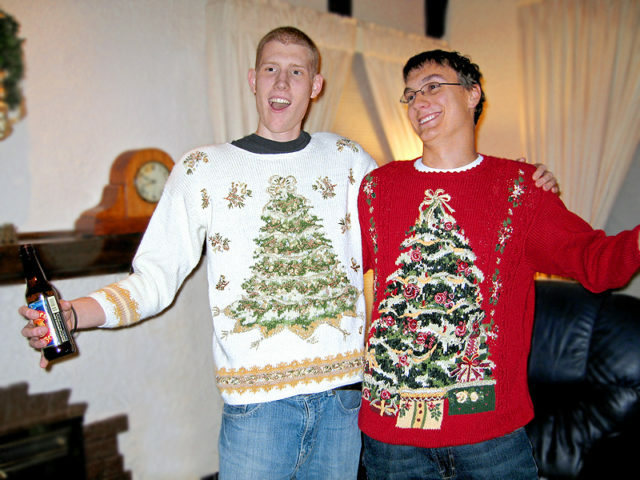 Perhaps the most common choice is simply for guys to wear a woman’s sweater to the Ugly Sweater Party. That may be a little over the top for some, but a ladies Ugly Sweater would probably be doubly ugly on a man. So you might win a contest! Some of the women’s ugly sweater candidates are actually universal or gender neutral — like the reindeer, snowman, and santa sweaters seen here. There are always tons of ugly choices left on the racks there. And, the ugliest are always the last to go, so it’s a great place to check for last-minute options the night before the party! Scour the Internet archives of Ugly Sweater Parties and see what other guys have worn to parties past. As an example, here are some more fun ideas for guys (and girls). Here too. You might be surprised by all of the “creative ideas” that have been seen at Ugly Sweater Parties. The sad fact of the matter is, few have taken the time to photograph ’em and post those pictures on the Web. Tacking some big pom-poms (made from yarn) onto a “regular” sweater… or one that’s been turned inside out! …Remember, the gaudier, the better! Those are always the ones that people are talking about the next morning around the watercooler. And if you’re not striving to be the topic of discussion at the watercooler… well, then you’re just not trying hard enough. Psst… If you’re anywhere near Minneapolis, there are Ugly Sweaters Parties here! Kevin’s collection of “ugly man sweaters” should be enough to make this guy your newfound hero. He’s been there, done that. And he’s got an entire Bad Sweater blog to show for it! And finally, for added motivation in coming up with an Ugly Sweater for this holiday season, have a listen to Bud Light’s Real Men of Genius “Mr. Multicolored Sweater Wearer”. …Happy Holidays to all. And to all a good night!